Ok .. first things first. I have updated Trevor’s and my blogs settings to do two things. First, I think I corrected the time on the posts. I won’t bore you with the details. The second improvement was to add a menu at the top of each blog so that you can navigate to each of the blogs. You should not have to hit the Back key any longer. Now that that’s over, I can get on with what we did today. Totally boring as you’ll discover. But I hope you like the minimal pictures I took today. Actually slept in until 6am today. But since we were in the Mountain Time Zone, it was more like 5am. Anyway, it was light enough to wake me up. Managed to get Trevor up pretty easily, surprisingly enough. Where we stayed, we got a free hot breakfast. What I mean by free is that they charged us more for the room than if we went somewhere else that didn’t have a free breakfast. But when the guy behind the counter said biscuits and gravy .. well .. that was it. No, that’s not all I had, but .. ok .. this is what I had. See .. I do eat more than that. 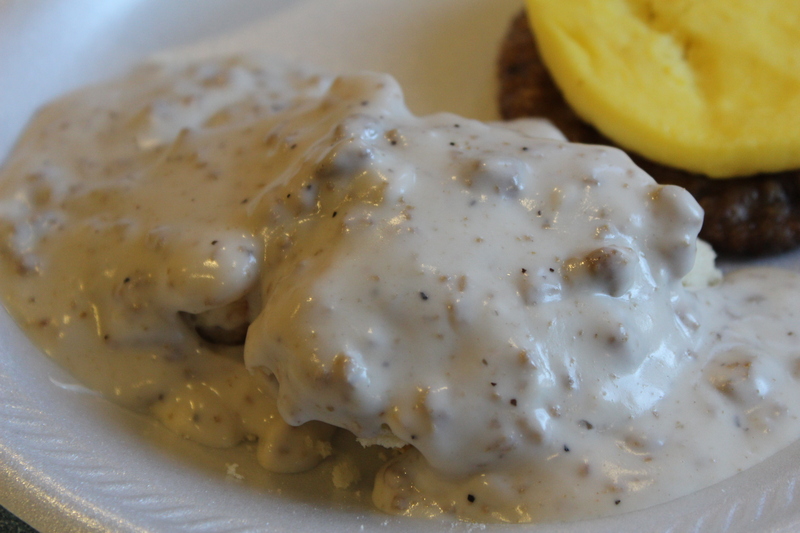 However, for you lovers of biscuits and gravy, this one’s for you. As we were leaving, something caught my eye, so I took a picture of it. 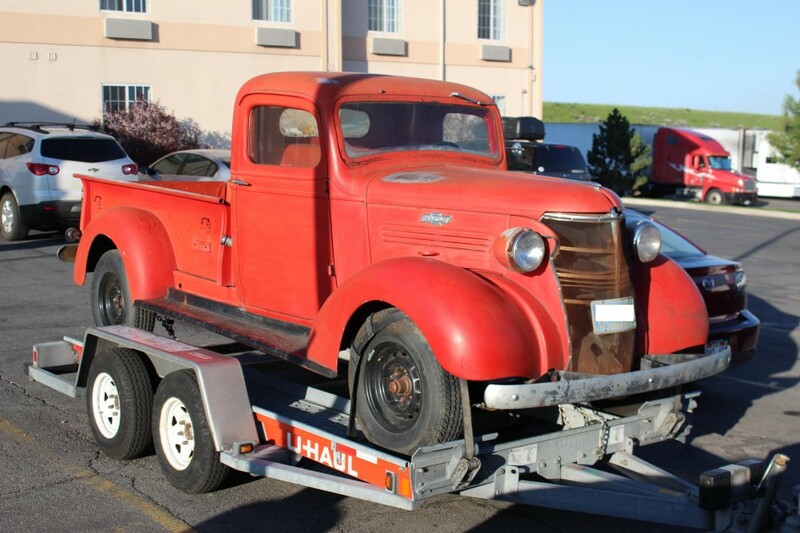 Finally, we can get on the road. It was a reall nice drive. No too mountainous for me. We were north of the major portion of the Rockies. It was like we were at the top of the world. Pretty flat driving, but you knew you were at a high elevation. It was weird, though, that I crossed the Continental Divide twice. Once at 6920 ft and another at 7000 ft. I have no idea why it would be at least 10 miles apart. I’ll have to look that up some time. But, that’s why I love driving. It’s not so much the destination, but the drive itself. Mabe you’ll get an idea of what I mean when I say we left Evanston, WY and next stopped in Big Springs, NE. That’s 500 miles of nonstop driving. Call me crazy, but it was an easy drive. I then called the wife and, for some reason she seemed pleased to hear my voice. We drove another 200 miles and are now in Grand Island, Nebraska. Tomorrow we should end up in Racine, WI where I have relatives. I’m hoping to drive through Rockton, Illinois as well, getting some pictures of a small town I know, as well as some houses, if I can find them. But I’ll explain all of that tomorrow. Thanks Darla .. did you see the pics? No password required for lunch. I love the “Mater” picture dear! I am hoping Alex will take me to the movies to see Cars 2. What a great movie ( the first one ) to watch for your road trip as it was about Route 66 as well. So what are gas prices like in the various states compared to California? In today’s Mercury news was a headline ” Bay Area gas prices are a bargain compared to Chicago area” I found that an interesting article since you are heading to Chicago. The reader posted that “gas in Chicago was $4.59 a gallon at some stations”. Gas prices? Let me see .. The lowest I filled up was in Davenport, IA at $3.39. It was 87 octane and up to 10% ethanol. The sign advertised gas at $3.29 but I didn’t see that one at the pump. By the way, our trip from Wyoming to Nebraska, I got 34+ mpg in a Toyota Camry. Very impressive. What a wonderful idea. The Biscuits and gravy, I mean. No, I think the father and son trip is fabulous and I too love Norman Rockwell. I wish you the best as you explore NR’S America, but, watch those biscuits and gravy (too many carbs). Looking forward to more photos. I love your pictures today! I also loved the “Cars” movie, and hope to see the second installment this coming weekend. 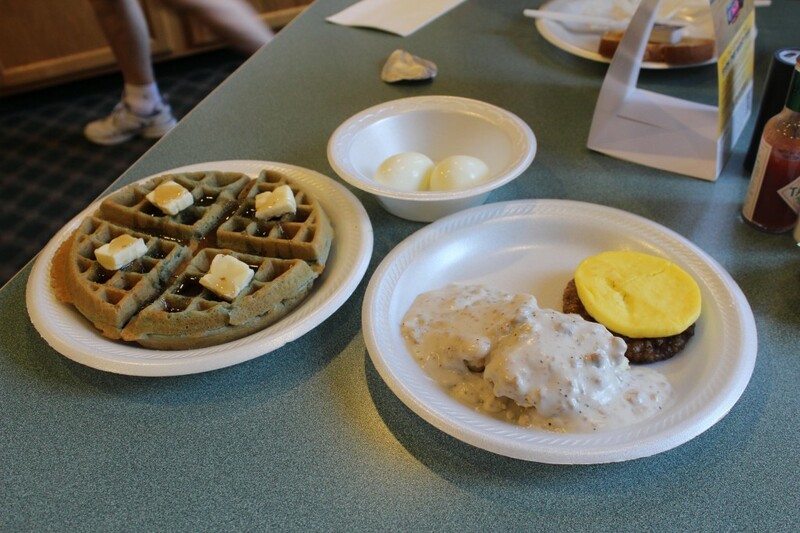 Hubby would love to have had biscuits and gravy with you! I think that is his favorite meal! Looks to me you had plenty of protein there to cover the carbs! I look forward to more stories and pictures! glad I’m not to far behind on your blogs. Yeah .. I thought of you when I took it. I also have a full profile, but didn’t post it. Beer yes .. sauerkraut .. uh .. don’t think so. When we were at my aunt’s we picked up a local beer called Fat Squirrel. Can’t get that in California. About 25-35 miles depending on route taken. Also told Trev about a place for phenomenal fish fry on Fridays in MKE, in case you are there. Yeah .. not sure if we’ll actually make the trip. We might have time on Wednesday before we head down to Chicago. We’ll see if the logistics are good. Just catching up on your blogs! Real fun. Reminds me of all the times I’ve driven the same road. You might not know, but Grand Island is home to a branch of Grandma Kocher’s family. I have a picture of three families of female cousins that all went to Grand Island college, must have been early nineteen hundreds, but I don’t know exactly. Sure .. NOW you tell me! :O) I didn’t know there was family there. But then, there’s a lot about my family I don’t know. When I was in Rockton, I was talking to a lady outside one of the 4 bars on the street and she knew the name Kocher. I don’t know how many relatives we still have in the area. Van, no I do not have a Facebook page or Twitter. However, you can subscribe to the rss feed and you will be notified each time I post.